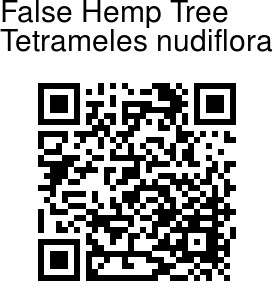 False Hemp Tree is a large, buttressed, deciduous tree, growing up to 40 m tall. Bark is greyish white, smooth; blaze cream. Branchlets are round, warty. Leaves are arranged alternately, spirally, crowded at twig ends. Leaf stalk is up to 10 cm long, velvety. Leaves are up to 12 x 10 cm, broadly ovate to rounded, long-pointed, base heart-shaped, irregularly toothed, somewhat leathery, hairless above, velvety beneath, 3-5 nerved at base. Flowers are unisexual, dioecious. 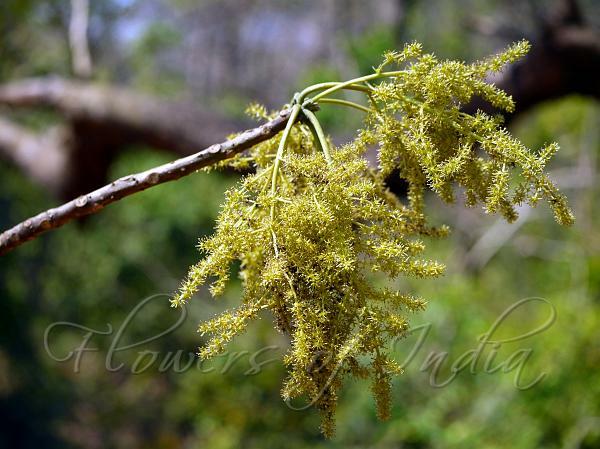 Male flowers are borne in velvety panicles, greenish-yellow, stalkless. Female flowers are stalkless, in spikes. Capsule is faintly 8-ribbed, glandular, urn-shaped, 0.4 cm long; seeds many, minute. False Hemp Tree is found at altitudes of 200-500 m in forests in tropical Himalayas (Nepal to Bhutan), large parts of India, Ceylon, Burma, Indo-China, Malaysia east to the Moluccas. Photographed at Phansad Wildlife Sanctuary, Maharashtra.